The ILO and Chinese Ministry of Human Resources and Social Security (MOHRSS) join forces to promote full employment and decent work in Cambodia, Lao PDR, and Myanmar. 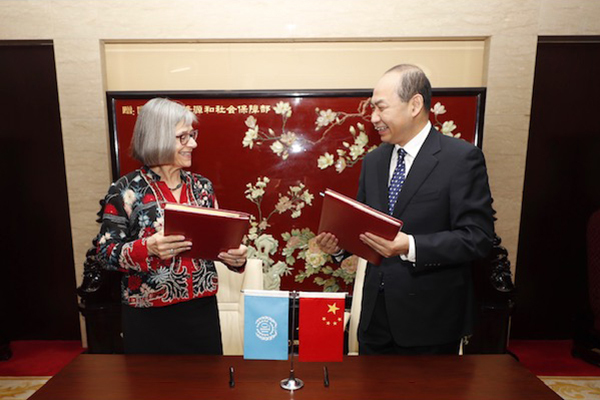 On 6 November, in Beijing, the ILO Deputy Director-General Ms. Deborah Greenfield and MOHRSS Vice-Minister Qiu Xiaoping signed a “Partnership Agreement for Promoting Development Cooperation with a Focus on South-South Initiatives.” The deal aims at enhancing public employment services, improving labour market information system, and boosting skills development in Lao PDR, Cambodia and Myanmar through South-South and triangular cooperation modality, focusing on facilitating the dissemination of China’s experience in promoting decent work and sharing good practices. The new Agreement builds upon a number of ILO-China South-South and triangular initiatives that have taken place since 2012 including in Lao PDR and Cambodia. It also puts into practice the 2018 ILC Resolution on Effective Development Cooperation in support of the SDGs. “China’s experience in promoting employment has been remarkable and I have no doubt that sharing the Chinese best practices will be a valuable asset for the success of this initiative,” said Ms. Greenfield. “Through this Agreement, we are making the ILO-China cooperation even stronger” added Vice-Minister Qiu. Commitment to the realization of the 2030 Agenda for Sustainable Development is a prominent feature of China’s growing role in the international arena. The ILO is committed to building on South-South and triangular cooperation to promote decent work and social justice worldwide. The signing of this new agreement creates a significant pathway for joint achievements.